Yay, my camera is BACK! Seems it just needed to dry out. So there’s new stuff today and MUM’s the WORD. Chrysanthemums are everywhere in Fall. I bought four plants for $6; two mid size @ $2 ea and two smaller @ $1 each. But I didn’t plant them outside. I’m using them for some quick indoor spruce ups. a basket, a pretty copper tray, some silk flower odd’s and ends, and fruit. Lots and lots of fruit AND veggies. Real ones, glass and wooden F & V’s. Now, get ready … this is a 1-2-3 DONE project. Line the basket with plastic wrap. Pop in two mum plants. Stuff in your silks and berries, for interest, height and filler. Spread scarf on table and top with tray. Add finished basket and finally, some small items for pop and more interest. TOLD YOU it was quick and easy. Next I just added a small mum to existing vignettes through the house. This one also includes some rose hip berries, clipped from my garden. Plants are a wonderful, live pop of color anytime of year. Mums relate to Fall so there you go. TIPS for working with live plants. 1. Protect your surfaces from water seepage. 2. Water frequently, especially with very small containers. These are important for any plants, but I left my mums in their flimsy plastic pots, which dry out in two minutes, so daily checks are an absolute. I also added a little extra potting soil in some where needed. The plastic wrap basket liner, and the tray are good protection for my table. HINT: With these little mums, if they do start to droop, remove them from your containers, set them in the sink, and gently water, letting water drain through well until the soil is good and wet. They should perk up quickly for you. More fun soon. Hope this was helpful. I had left my camera outside … yes, overnight … I know, DUH. I put it on a shelf for a few weeks, gave it another try and seems to be fine. My daughter dropped a hint for next time though. Put your camera … or in her case, your kid’s phone, in a zip-lock bag filled with rice (uncooked of course). Zip it up and let it sit a day or two until it works again. PLEASE leave a reply. I LOVE to hear from you. Mark to follow the comments and you’ll see my note back to you! What are we crafters and DIYer’s always on the hunt for? Besides FREE stuff, I mean. Something we just cannot find enough of. C’mon, you know this one. GRAPHICS of course! And yes, free graphics, right? No royalty or fees. Well, I have em’ for you . . . tons of them even! and enter a wonderful world of vintage graphics. Everything from fonts to flowers, birds to children, all kinds of pretties. 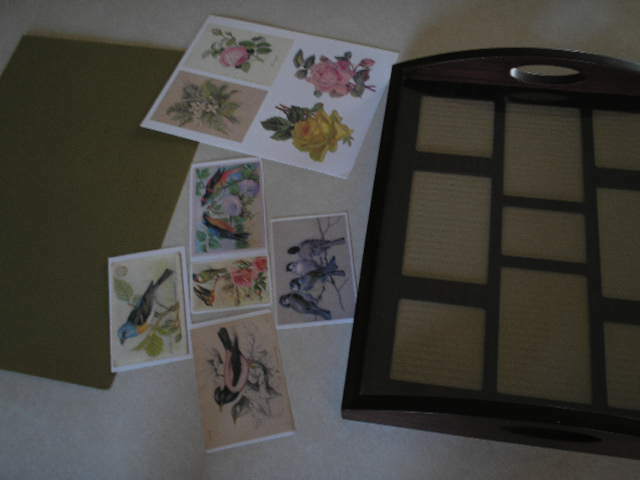 Last summer, I found this brand new wooden tray at a garage sale for $3.00. It had a dark finish, which I liked, and a glass insert on the tray. Ooh, but it gets better, because it also has a matted sheet . . . you know, one of those multiple photo cutout frame dealies. I wanted a quick, clean project for today, and I still hadn’t done anything with my tray. I was also trying to develop an idea for Mother’s Day. My mom isn’t here any longer but I was thinking about all the things she loved. Long story short. I headed over to Karen’s place at The Graphics Fairy and searched for flowers and birds and nature offerings. 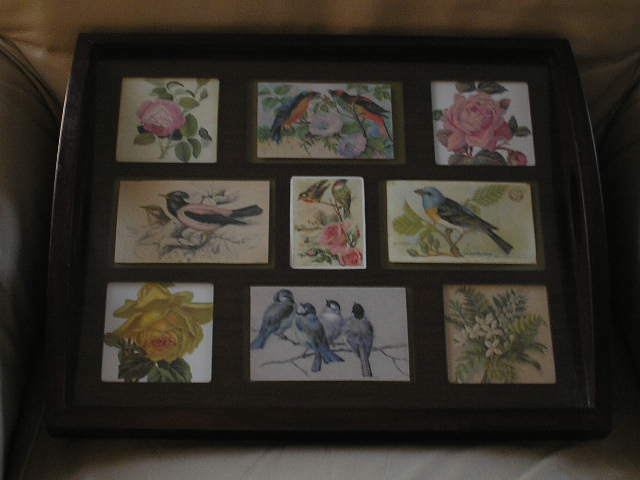 It was difficult to decide on favorites because there were so many beautiful options, but I chose birds and flowers . . . in honor of Mom. All I did was copy them onto my desktop. Then I printed them, sizing each down close to the openings in my frame mat. 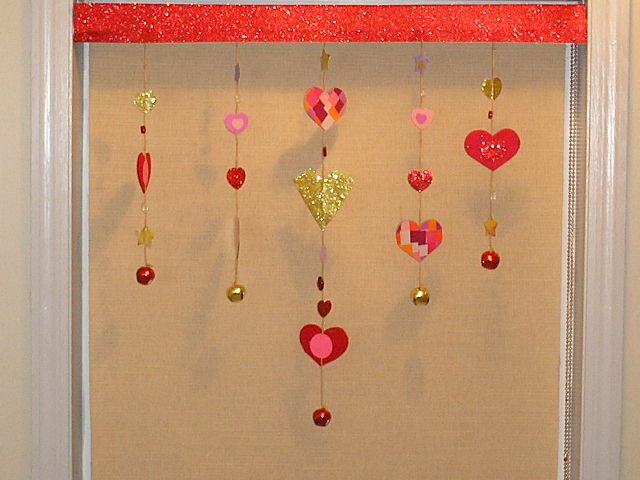 Some couldn’t fit just right, so I used a coordinating sheet of craft paper to back the frame and fill in where needed. A couple years ago, Hubs and I took an old chair apart and made a little bench. Our tray sets atop that and we use it as an end table most of the time. It’s double duty and we can always remove the tray and have extra seating! 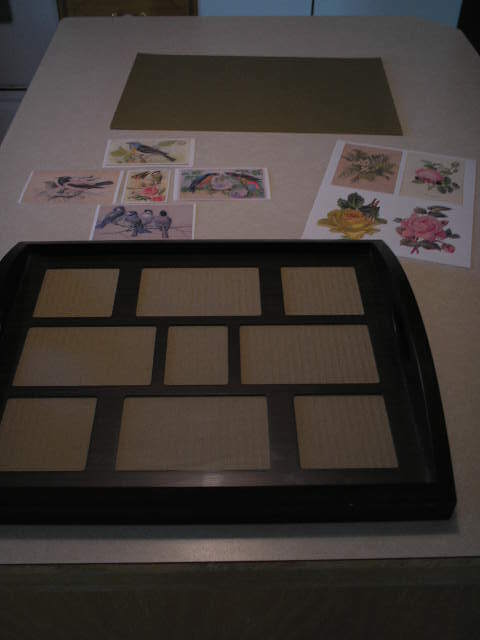 TIP: On a plain tray with no photo mat or glass, you can decoupage some beautiful graphics on, let it dry completely (let it sit for a day or two) and put a piece of clear vinyl contact paper over top. This original article “Marvelous No-Mess Project” appeared first on Artzzle.com. No included content or photography can be used elsewhere without specific permission and accreditation.